Pioneers in the industry, we offer potassium bromate for improving flour from India. 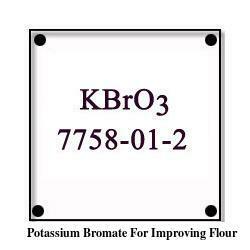 We provide Potassium Bromate For Improving Flour. Based on new techniques and modern machines, we are involved in offering a quality range of Potassium Bromate For Improving Flour. These products are finely formulated under hygienic conditions and ensure longer shelf life. All these products are widely appreciated for their purity, superior quality and reliability. We ensure timely delivery of our products. This Potassium Bromate for Improving Flour is available in market at reasonable rates. Looking for Potassium Bromate for Improving Flour ?